Sometimes you come across a home so well built, so well considered in its design, layout, mechanics and structure that you marvel about the time, money and effort that goes into achieving such a feat. The owner/builder of this exceptional home was a developer/builder in Canada. He has brought the high Canadian quality of his trade to Celestun and it is reflected in this, his family home. No expense was spared and it shows. \rAll the cement was mixed to the builder's high standards. All the reinforcing rebar is twice coated in high quality anti-corrosive. All the electric wire is of a thicker gauge than code requires. The quality of materials you cannot see, you can feel in the sturdiness of the home. A 3-mtr thick x 3-mtr deep storm wall, on the beach side, provides the ultimate protection from storm tides (rare on this side of the Yucatan Peninsula). 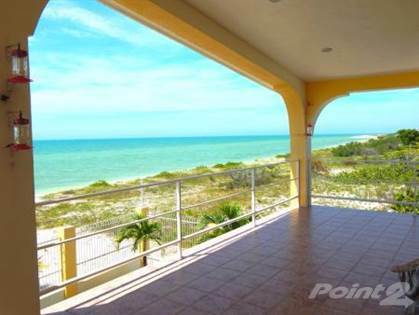 \rThis large beach front villa perfectly accommodates this spacious, sunny, open floor plan, 2-story home. Only 1.7 km north of Celestun. The home boasts 3-bedrooms, 5-baths, an office (Den ) , laundry, bar, an extensive patio and a considerable 2nd floor patio that vibrates with hummingbirds and looks to the sea. The commodious 3-car garage, shop and bodega provide room for all your favorite toys. The entire house is air conditioned with inverter type units, including the shop. A new 110/220 electric service and 62 solar panels provide the juice to keep the place humming. But just in case you have an outage, the 11,000-watt gas generator will keep your lights on, the refrigerators cool and maintain a room or two with a/c. It will also keep the house alarm/detection system and the perimeter electric sentry operating to keep out unwanted guests. \r\rThe features of the home and property are countless: \rAutomatic sprinkler system throughout the entire garden and yard \rLot Size: 31.8 x 38.6 = 31.8 meters of Beach front \rConstruction Size= 7,856 m2 \rEnormous sweet H20 cistern with high grade, on-demand, submersible pumps \rOn demand H20 pressurization system \rReverse osmosis & ultraviolet H20 purification system \rCity water and 2-wells \rLandline telephone w/super internet \rCompletely enclosed and secure compound with video security system \rSpacious Palapa/patio with gas grill \rBaths and kitchen pantry/laundry walls are tiled to the ceiling \rInverter type Mini-split a/c in every room \rCustom hickory kitchen cabinets - all extra deep built by a master cabinet maker in Canada , New granite counter tops , with large island for baking \rBrazilian Mahogany doors throughout \rHunter Ceiling Fans throughout \rHigh end ceramic floors throughout \rSpacious cooks kitchen w/professional Jenn Air Grill, Jenn Air Convection dbl ovens and GE side by side refrigerator/freezer \rWhirlpool ,Energy Star front load washer/dryer, \rLuxury brushed chrome microwave and dishwasher \r2-master bedroom suites with oversize baths and glass block showers \rSpacious solarium off dining/living areas \rFully illuminated exterior gardens and beach \rHigh quality sliders and windows. Double thick glass complete with metal protectors \rHouse closes up tight. No sand. No wind. No noise! \rElectric front gates with Interlocking brick walkways and driveway \rFabulous beach views, breeze and flocks of Hummingbirds! \rAppliances and some furniture included \rSecurity cameras throughout, alarm system and solar power system so no electric bill \r\r\rMAIN HOUSE \r• 3 Large bedrooms & Den \r• 4 full bathrooms \r• 1 Guest bathroom \r• Spacious Living Room \r• Indoor Terrace closed to extend use \r• Very Large Dining , overlooking ocean \r• Office (Den) \r• Fully equipped kitchen with: \r• cabinets custom kitchen hickory • New granite countertops , C/w large island for baking \r• Professional Jenn Air Grill • Jenn Air Convection double ovens • GE side-by-side refrigerator / freezer • Whirlpool - Energy Star - front loading washer / dryer • \rLuxury brushed microwave and chrome dishwasher \r• Large balcony facing the sea \r• Direct access to the roof \r• Hunter ceiling fans of high quality throughout \r• Air conditioners Invertor energy savings type \r• High quality ceramic floors \r• Brazilian mahogany doors throughout the house \r• Large Laundry/ pantry off kitchen \rOUTSIDE \r• Large garden with many mature trees and tropical plants \r• enough room for a large pool \r• Covered Palapa with gas grill \r• Huge garage for three cars \r• 3 Insulated garage doors/ automatic openers \r• utility room , maids quarters off garage with full bathroom \r• RV connection \r• Wiring + electric wire on top \r• Large automatic entrance gate \r• Separate visitor entrance \rCONSTRUCTION CHARACTERISTICS + MORE • The cement was mixed with the high standards of the builder \r• All the reinforcing rods are coated twice with high quality anticorrosive \r• All the electric wire is of a thicker caliber then the standard. \r• Storm wall 3 m thick x 3 m deep \r• Electrical service 110/220 \r• 62 solar panels \r• Alarm system + perimeter electric sentry + video surveillance \r• Automatic sprinkler system throughout the garden \r• Huge H20 tank with high grade submersible pumps on request \r• On-demand pressurization system H20 \r• H20 reverse osmosis and ultraviolet purification system \r• Drinking water and 2 wells \r• Landline with super internet \r• House closes well. Without sand Without wind. Any noise! \r• Appliances and some furniture included \rList price: $779,000.00 USD closing cost included\rLocated 1.7 km. al North of Celestun.